The latest book by Dominique Steiler (Osons la paix economique) deconstructs the paradigm that man is wolf to man. As a senior professor at Grenoble Ecole de Management and leader of the Mindfulness, Well-Being at Work and Economic Peace Chair, his book aims to revive the concept of collaboration in companies—the goal being to foster greater well-being and improve each company’s contribution to society. What is at the heart of your latest book, which is based in large part on the experiences shared by companies that support the Mindfulness Chair? 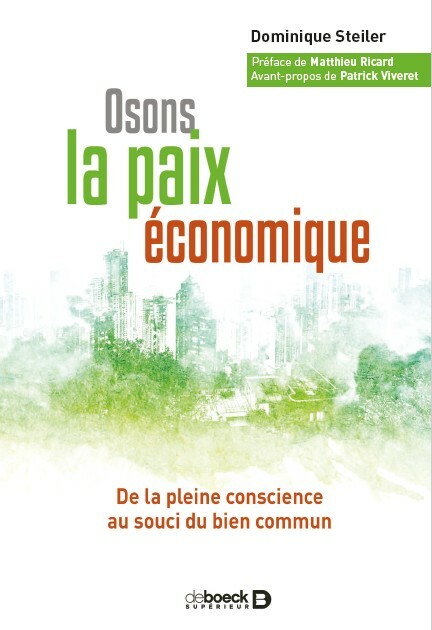 « Osons la paix économique », is published by De Boeck Supérieur. This book provides a wide array of thoughts, research results and concrete company experiences that were gathered by our research center to better understand life at work. The idea is to offer a new perspective, a new way to look at work and the belief that economics is a human question. It is possible to consider work in a manner that makes humankind the central concern for organizations and companies. Businesses create goods and wealth. As a result, they play a major role in society. Business and work help determine each person’s balance and satisfaction in life and society. This can be a catalyst for societal evolution and greater fulfillment for all. One of the goals of this book is to share how we can implement positive values in the workplace. You defend the idea that companies should be at the service of cities and help improve relationships. This goes beyond achieving successful company performance. Can you explain? This book does not offer new methods. It does not prone individual success or personal realization. It does not reject difficulty or failure. The main idea is really to invert the role occupied by companies in urban life. Economic peace is based on the hypothesis that businesses can be agents of social development and cohesion. Profitability comes as a natural result of this. Unfortunately, the opposite is true today. Cities are at the service of companies. The best example of this is the fact that the entire school system is based on creating attractive profiles for employment. Education should be focused on fostering values, personal development, collaborative spirit and solidarity. How do you explain this change? We live in a neoliberal capitalistic system that overrates the individual. We have managed to convince ourselves that we are all completely independent from each other and that our success is to be found in individual performance. Our top models are world champions and industry giants. For some people, this model leads to the choice of an alternative lifestyle that forces them to remain on the margins of society. However, for most, it leads to a wild goose chase to fit in and be successful in a model which is based on consumerism and social recognition. Each person focuses on personal survival. The fear of failure becomes the primary factor behind our actions. In the business environment, this model makes it difficult to implement cooperation, support, compassion, the desire to help others or the ability to ask for help. Work is no longer about contributing to a bigger picture. Instead, it is focused on always winning more to hopefully live a happier life. To achieve success, this model only provides one option: Win more and ensure the company wins against its competitors. We believe, instead, that mankind is naturally collaborative and only aggressive in certain contexts. Both characteristics are part of us, but that means we all need to share and be part of a group. Companies and work can be vectors to reach fulfillment with respectable work conditions and good health. What are the key parts of your book? The book is built around three sections: first, the experiences of our partner companies that defend new values and business practices to encourage personal fulfillment and therefore, group fulfillment; second, it shares how to find meaning in shared work; and third, it describes several types of organizations that can provide individual and group fulfillment. By working with others, I contribute to something bigger. In other words, how can individuals find a spiritual (without any religious connotations) vision of advancing the greater good. When you have an organization that is permeated by the greater good, each individual's goals become a path to fulfillment. Chris Ruane, ex-deputy, U.K., in charge of Mindful Nation UK project. This list is a starting point and will be regularly update on the chair’s website in order to keep track of all participants who wish to share their support and experience.